Vitamin D helps regulate the amount of calcium and phosphate in the body – nutrients needed to keep the bones, teeth and muscles healthy. A lack of vitamin D can lead to a deficiency, which can cause bone problems and deformities. In children, vitamin D deficiency can lead to rickets, while adults can experience bone pain caused by a condition called osteomalacia. One of the more obvious signs of vitamin D deficiency is therefore pain in the bones, but there are also some more surprising symptoms of the condition. 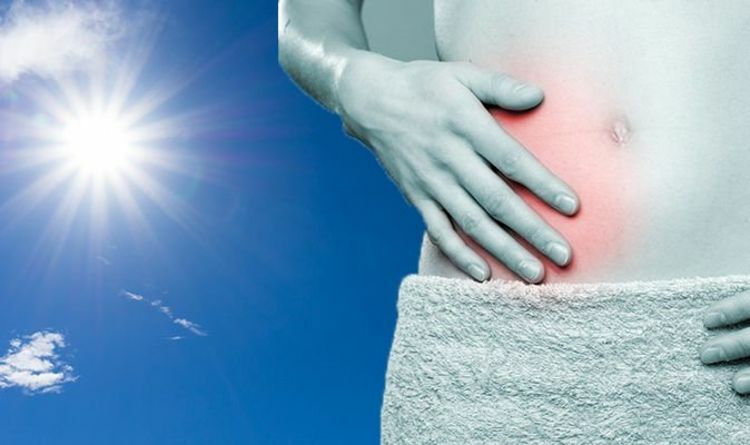 According to Dr Steven Lin, another common symptom of vitamin D deficiency is gut issues. Vitamin D plays a part in keeping the immune system healthy, and a weakened immune system can cause problems with the gut and digestion. Vitamin D also helps boost metabolism, which can prevent digestive problems from occurring. Health foods store Holland & Barrett also notes gut problems can affect the ability to absorb fat, which can impact vitamin D levels. This is because vitamin D is a fat-soluble vitamin, meaning it can be dissolved in fats and oils. So if you have gut and digestion issues which are affecting your ability to absorb fat, you may not be absorbing enough vitamin D either. “Something to be aware of if you have IBD, Crohn’s, celiac, or gluten sensitivity,” notes Holland & Barrett. According to Dr Lin, it is estimated that half of the world’s population is vitamin D deficient. Most people get enough vitamin D from spending time outdoors in the spring and summer. This is because the main source of vitamin D is sunlight – which is absorbed and turned into vitamin D when reflected on the skin. However, in the autumn and winter when there is less sunlight we don’t get enough vitamin D naturally, which can lead to deficiency. For this reason, health officials advise taking a vitamin D supplement every day during the colder months. According to health experts, most people need 10 micrograms of vitamin D per day to maintain healthy levels. Supplements should contain no more than 10 micrograms of vitamin D per day, as taking too much can cause too much calcium to build up in the body, leading to bone, heart and kidney damage. Vitamin D is also found in some foods, including oily fish, red meat, liver, egg yolks, and some fortified foods.